For several years, the Facility and the MicroInsurance Centre’s Microinsurance Learning and Knowledge (MILK) project have been assessing if low-income people actually benefit from insurance and how the value they derive from insurance can be enhanced. This three-part series summarizes the evidence, translates the results into guidance to improve client value for practitioners and consultants, and provides recommendations for policymakers, funders and other stakeholders. Together this evidence makes a substantial contribution to the body of work on client value. Introductory letter on the series from Michael J McCord and Craig Churchill. Brief #1: Is there value in microinsurance? The first brief introduces the theory of change through which value is realized and presents the evidence of impact in terms of improved financial protection, reduced vulnerability, and better health. 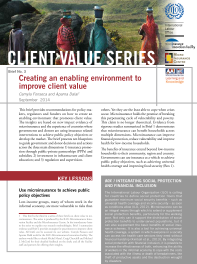 The second brief in the Client Value series provides recommendations for insurance companies, other risk-carriers and distributors (broadly defined as providers) on how to improve the value that their microinsurance offerings provide to clients. The last brief of the series provides recommendations for policy-makers, regulators and funders on how to create an enabling environment that promotes client value. The insights are based on new impact evidence of microinsurance and the experience of countries where governments and donors are using insurance related interventions to achieve public policy objectives.